Dive into fourteen tales of non-themed horror, with short stories and dark poems by some of the best horror writers in the world, including a story by the master himself, Graham Masterton. 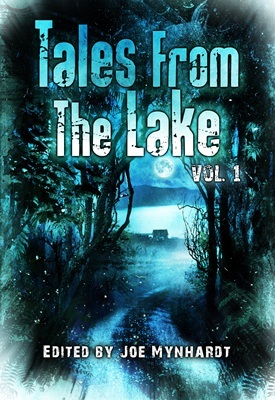 Allow the very first installment of Tales from the Lake to transport you to lakeside terror in “Lover, Come Back to Me”, “Lady of Lost Lake”, and “Game On”; journey to the basement of your local pet store in “Dead Pull” and your neighborhood pub in “O’Halloran’s”; visit the apocalypse in “Devil’s Night”; travel to Africa in “Witch-Compass” and “The Reunion”; spend time with talking dolls in “Don’t Look at Me”; experience the horrors of drug addiction from close up in “Junksick”; and climb a ladder to the heavens in “Perrollo’s Ladder”. Tales from the Lake Vol.1 includes the winning stories from the 2013 Tales from the Lake Horror Writing Competition: a nautical tale in Jennifer Loring’s “The Fine Art of Wrecking”; a bizarre story of strange addictions in J. Daniel Stone’s “Alternative Muses”; and a cult horror story in the jungles of South America in William Ritchey’s “Las Maquinas”.